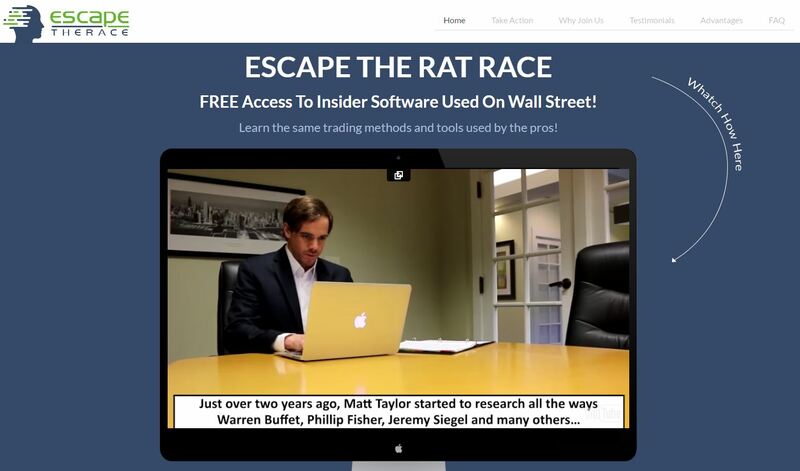 This review is about a new binary options scam called „Escape The Rat Race“. It is presented by Matt Taylor. 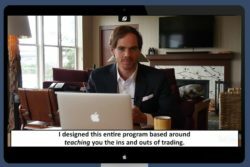 Taylor says that he developed a binary options trading software that uses the same methods that have been used by the world’s leading financiers. He called it Escape The Race. Taylor’s program allegedly teaches you how to look at financial markets and trading. His software uses moving averages, MACD and Fibonacci tools to predict market movements. With this program 89 % of users allegedly make 5 times more money than in their last job. And it is free. Listening to the Escape The Race presentation was really funny. Taylor trying to speak like an insider, but anybody who ever tried trading must immediately see that he is a liar with no trading experience whatsoever. Moving averages and MACD are certainly not leading indicators, in fact they are lagging. And there is nothing secret about Fibonacci tools, they are widely used by traders. Taylor in reality is just a paid actor playing a role defined by scammers who created the Escape the Rat Race scam. On the Escape the Rat Race web page you can see some testimonials of alleged real users of the program. But they are fake. Look at the picture, user’s photos have been stolen from various sources all over the internet. We looked at the app that is supposed to make you much more money than you are making now. And we immediately recognized the most used software by binary options scammers. On the picture you can see some examples, it is used by the Bank Tracker Bot scam for example. And many others. This software is losing money to its users and it is offered by scammers only. Escape The Rat Race is a simple binary options scam designed to make you lose money with a software that has no real edge in the markets. To make money with binary options you need to build a profitable strategy on a demo account. Only then you can trade live with your money. Don’t invest with any program that pushes you to risk your money from the first trade.